San Francisco and the Bay Area have long been the birthplace of innovation and startups, and interestingly, in recent years the area has also morphed into the breeding ground for thriving (although mostly nomadic) local opera companies. I have covered a few of them here in the past, but one such company very close to my heart is Ars Minerva, founded by its artistic director mezzo Céline Ricci. They have lofty ambition as mission statement: “Bringing forgotten music back to life” and the last three years they have successfully presented modern-day premieres of three 17th century Venetian operas. Last weekend, Ars Minerva upped their game by mounting an 18th century baroque opera, Giovanni Porta’s 1738 Ifigenia in Aulide in the ODC Theater. Born in Venice, Porta (1677-1755) traveled and held posts all over Italy before Handel brought him to London; he composed the very first opera staged by the Royal Academy of Music, Numitore in 1720. Unfortunately, Porta didn’t find much success in London, so he went back to Italy before eventually settled in Munich. He wrote 30 works for theater, some of which in collaboration with other composers. The general outline of the story is the same as in the Gluck, but Zeno’s libretto more closely follows Racine, in which another princess was revealed to be the gods’ desired sacrifice. To my ears, there were a lot to be admired from Porta’s very dramatic opera, as there were aspects of it that even went beyond the usual Baroque practices of the time. The most striking feature of the opera for me was the extremely complex trio for Ifigenia, Agamennone and Clitennestra in Act 3 (“La figlia t’ubbidirà”/”La madre ti feguirà”/”E il padre ne morirà”), where each portrayed different emotion (respectively resignation, worry and anger) layered on top of each other. Scored for two sopranos and a trouser-role mezzo (or most probably a castrato during the premiere), the trio seemed to look forward to the famous Act 3 Trio from Der Rosenkavalier. Another fine example of Porta’s artistry was the expressive Ifigenia aria, also from Act 3, “Madre diletta”, where she bade goodbye to Clitennestra. Similar in mood and tone to the famous “Scherza infida” from Handel’s Ariodante, the aria was remarkable for the declamatory nature of the first “Madre”, a perfect place for the singer to show off her embellishment skills. This aria was also quite possibly the first ever recording of music from Ifigenia. For these performances Ricci, who also directed and sang Achille, assembled a group of fine local talents for the roles, some of them returning from past Ars Minerva productions. In the title role, soprano Aura Veruni‘s sweet and creamy tone proved devastating in “Madre diletta” and naively hopeful in the “Verace o menzognera” that closed Act 2. As Agamennone, mezzo Nikola Printz’s dark voice sounded masculine, conveying the character of a father with a tortured soul. She provided a strong contrast with the bright lyrical output of soprano Shawnette Sulker as Clitennestra. Sulker imbued Clitennestra with a sense of anger and resentment, as if in foreboding of her eventual complicity in his murder. Right from the start of her opening aria “Asia, tremi, Ricci demonstrated her virtuosity as Achille, not only vaulting up and down the many torturous coloratura passages, but also sounding lost and dejected during the goodbye aria “Sposa, addio” in Act 3. The role of the “other” princess, Elisena, was sung by soprano Cara Gabrielson with such splendor that she stole the show every time she appeared. 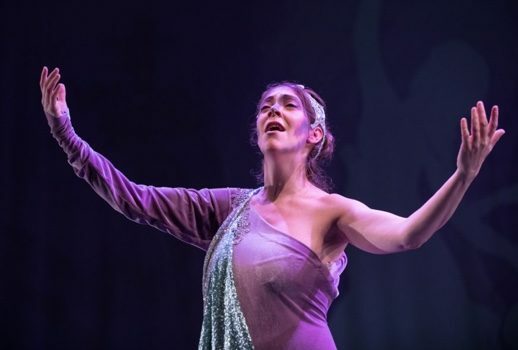 This villainess flirted, schemed, manipulated her way to the altar, eventually stole the limelight from Ifigenia as Grecian sacrifice; with her facial expressions and mannerisms, not to mention bold expressive voice, Gabrielson brought the character to life. Three male roles were sufficiently cast; countertenor Matheus Coura’s Teucro was wimpy and lovelorn, Kevin Gino’s Ulisse was obnoxiously bold and Spencer Dodd’s Arcade was earnest, albeit rather unsubtle. 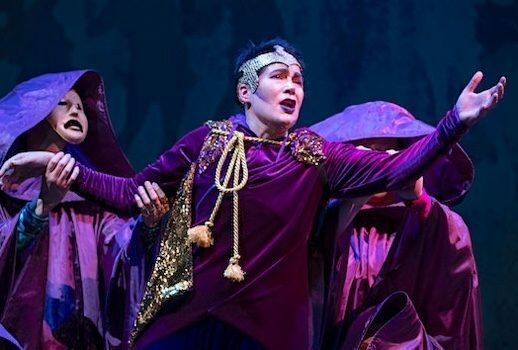 Ricci was very resourceful in using her singers; when not singing, they donned oracle-like oversized hooded robes and gold masks and they turned into multi-purpose props, ranging from backup dancers to temporary throne for Agamennone. Their presence throughout the opera gave a constant reminder that we were in the world of Greek mythology. My only complaint with the direction was that there was a lot of portrayed violence towards women in Act 2, when in adjacent scenes Achille, Ulisse and Agamennone were shown to abuse their women. Nash’s costumes were dominated by bold colors, striking both Agamennone’s and Clitennestra’s costumes were in different shades of purple. Purple seemed to be the modus operandi for Jack Beuttler’s lighting as well, resulting in mauve glow that permeated the whole stage, although Beuttler did accentuate dramatic moments with white spotlight. Nicole Spencer Carreira’s projections completed the set with a series of Greek images; I particularly enjoyed seeing the Greek helmets on screen when Ifigenia and Clitennestra’s escape plan was thwarted by Ulisse and his army! Derek Tam, the de facto Ars Minerva music director who has led all the past productions, led an effective reading of the score that kept the evening moving, while also functioned as the harpsichordist. He employed a slightly bigger orchestra this time, with ten players including himself. I was glad to see that both performances were very well attended, they even posted the sold-out sign on the second night! I hope this will motivate Ars Minerva to venture more modern-day premieres in the future.